It's Thursday again and to continue with what I have been doing in the past three months or so, I would like to present you with Happy Mom n Bub Photo Project: Week #12. 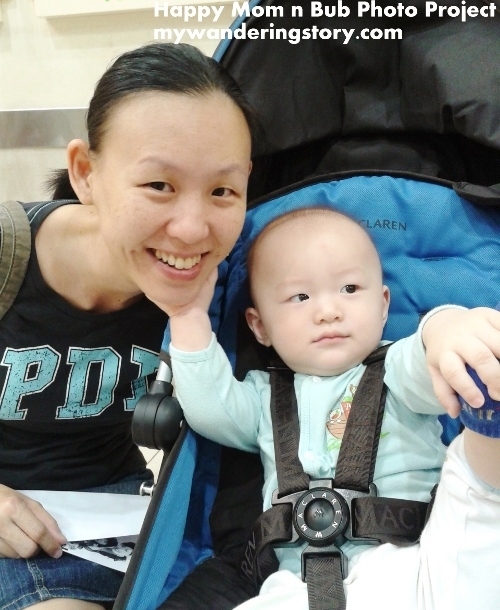 Mommy Belina and Baby Michael from Balikpapan, Indonesia. Interested to show the world the sweetest picture of you together with your sweet little one in my blog every Thursday too? Read here to find out how. Last Sunday I was feeling itchy to bake a cake but didn't really know what to bake because I didn't plan ahead. I spent my whole Sunday afternoon browsing some random cake blogs and finally, came across a blog which shares a professionally done chocolate marble cake recipe and the recipe guarantees tender and moist cake texture too! The last time I made marble pound cake, it was nice but the texture was a little heavy for my preference. Without thinking too much, at 5pm I began baking the newly found marble cake recipe which used egg separation method and at dinner time, I finished baking the cake. I only used half of the stated recipe so my cake's final result was kind of thin. Also, I guess I put on too much chocolate cake batter too, hence I didn't eventually produce that wonderful marbled effect that I imagined. Nevertheless, the cake surely tasted really yummy, buttery rich and super moist too even until the next day - just like what I wanted. Super moist chocolate marble cake. Here's the moist marble cake recipe that I used. Preheat oven to 160 degree. Sift flour, baking powder and milk powder. Set aside. Cream butter with electric mixer until light and fluffy. In separate bowl, whisk egg yolk and sugar until light. Slowly add the egg yolk and sugar mixture into the creamed butter and beat them with electric mixer on medium speed until everything is incorporated. In separate bowl, beat egg whites using electric mixer until stiff peaks are formed. Add in the dry ingredients into the cake batter until just incorporated. Take 1/4 of the cake batter and mix it well with the cocoa powder. Pour cake batter into a 7 inch cake tin already lined with parchment paper - alternating between the two mixtures. Rap the pan on the counter several times before putting it into the oven. Bake the cake for 30-40 minutes or until a tester inserted in the middle of the cake comes out clean. Initially, I hesitated whether I should share this recipe or not because the look of my cake's final result was a far cry from the original blogger's recipe. Anyhow, in the near future, I plan to test this recipe again, this time using the full ingredients and see if I can achieve that good looking tall marble cake as if it was made by 5-star hotel's pastry chef! For first-time parent with no helper (but my husband) like me, the first year of raising a baby feels like a constant marathon of body and mind. Everything is fast-paced and it happens every single day. Some days run faster than the other because I got so crazy busy doing a million things in a day. I am still very much sleep deprived because my baby's sleeping schedule at night is still irregular to this very date. I've even forgotten what a real proper holiday feels like. Don't envy me but I did lose my pregnancy weight in no-time. My biceps and abdomen became toned (not exactly like Britney Spears's when she was a hot babe in her prime years though) without doing any exercise, stepping into a gym nor doing any strict diet. Last year: Miss this little baby already. Days, weeks and months glided by. Since the moment I first carried my newborn in my arms - almost a year slipped away. The baby who used to snuggle in my arms and fall asleep on my chest is no longer a baby and refuses to sleep when I cradle her. She is now a one active little kid who can talk baby language, is very curious of this wonderful world and able to walk around all by herself. The relentless early days that I thought would never end is now a distant memory. This year: Ain't a baby no more. Although I feel that I have accomplished pretty well in raising a happy and healthy baby on my own, I have two regrets. 1. I should have cherished the time and enjoyed my baby more. In the beginning of my motherhood journey, I always felt so tired both mentally and physically. Also, shortly after the effect of epidural was gone, I felt so injured. This horrible post-delivery feeling went on for the next three weeks or so. This traumatic situation was also coupled with prolonged post-partum bleeding and exhausted body which was trying hard to fit my newborn's schedules. In short, my first month with my baby was not that euphoric and surely I was not able to fully enjoy my newly bundle of joy. I wished the time away. When Naomi was still three days old, I wished she's one week old. When she was few weeks old, I wished she quickly turned to one-month old so she's not that fragile, could do more and had better routines. I could not wait for her to be able to turn her body over, crawl, walk, talk and so on. I tried to enjoy the moment but I think I didn't enjoy it optimally. I thought when she grows older, it would be easier to take care of her. Well, at some points, it is true - when Naomi grew bigger, I got to know her better and she was easier to deal with. However, she launches developmental milestones that present new sets of challenge for my husband and me on monthly basis so in that sense, both of us keep on learning and handling new things about the little human being in our house every single day. In addition, I guess back then I was so overly busy caring my baby 24/7 that I missed the beautiful new Mom experience. I really should have taken more real time to hold, cuddle and do nothing else but bonding with Naomi without being distracted by my housework that kept on coming, iPhone or soap opera on TV. That's why when you hear people say"Babies grow up so fast!". You must trust them because it's true. Just enjoy the moment and your baby more. 2. I should have taken care of myself better. Soon after my Mom went back to Indonesia during my confinement period, I led a super hectic life attending my baby's needs mostly on my own to the point that I neglected my own well-being. I skipped meals (hence often suffered from gastric pain and became very thin), slept a little or slept few good hours but not quite rested and often lost my appetite when I heard my baby cried or my head was full of today's to-do-list. Thinking back, I should have just chilled, taken my sweet time to eat my food, enjoyed more me-time like snacking, lying on my bed with my scary face-mask on (principally until I fall asleep and the mask dries up), going to a hair salon and letting someone else wash my hair, getting some pedicure, reading my favourite magazine undisturbed, putting my make up on before leaving my house or baking - just like the good old times. This way I would feel that raising a baby is not so taxing and doesn't cause ageing faster. Anyhow, a happy and healthy woman who eats and lives well is surely a good reward for her baby too, isn't she? My advice is just to know the limit and give ourself a break. We don't have to be joined at the hip with our baby all day long. When the situation gets overwhelming, it's not a sin to get somebody's help. Asking for/getting a help or splitting the baby sitting job with our partner doesn't make one an incompetent Mom, provided if he is willing to help and capable of baby sitting of course. 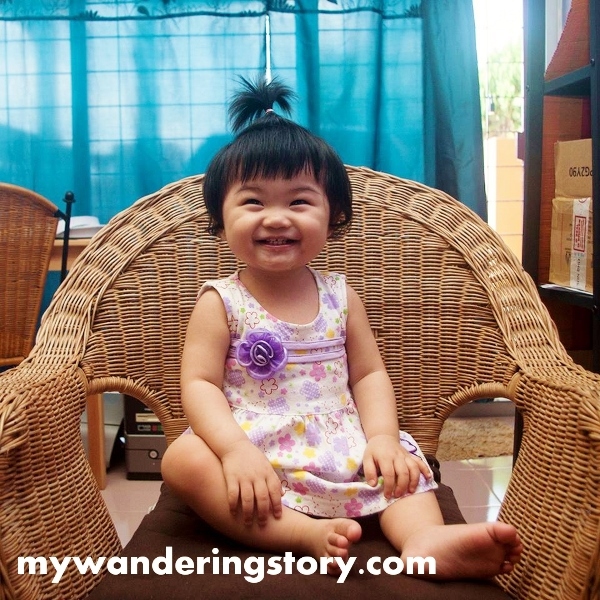 Thus, now that Naomi barrels towards her first birthday next month, I intend to slow down and order my busy life (blogging, part-time work and daily housework) and have a little more fun with Naomi. I will spend more time becoming the 'old me' again and at the same time carefully noticing my baby grow each day. I will dedicate more time to relax, sit on the floor with Naomi playing with her shape sorter toy, doll or whatever and enjoy the little girl in front of me. A while ago, my husband bought a cheap remote control car he found on sale from a supermarket. When he did that, my initial reaction to him was "Why are you buying this thing? Why do you still want to play with this kind of toy?" At heart, I continued my rambling and it sounded pretty much like this, "Did you not play with this thing enough when you were a young boy? It's time to grow up, man..."
Then, one evening, my husband came home bringing a baby bike seat for Naomi, a bubble gun and water guns. Again, my first reaction when my husband happily showed me all the things inside his shopping bag was, "Why oh why did you have to spend your money on this stuff? It's not like Naomi can play with you with these stuff anyway...". When I questioned him, he just said "Don't worry. Everything was so cheap! Like super cheap!" and still widely smiled to me and Naomi like a kid who just got a toy. Well, technically, he just got himself some toys anyway. I did not entirely comprehend my husband's toy shopping spree but I let this matter go. There were times when I felt like instead of having one kid in my house, I have two. It's just that the other one is in the form of an adult man. However, after looking at how Naomi can actually play with his Dad with all the random toys that my husband brought home and actually enjoy every single one of it - I realized that I was so wrong about my husband and his ideas of playing with his kid. I mean who knew that after watching his Dad playing his remote control car for few times, my then 9 months old baby could follow his Dad's steps in playing with the remote control and make the car move around? The best thing is that she enjoys playing with this remote control car so much that I found this toy is very useful in distracting Naomi when she's fussy and it indeed can buy me some time when I am busy. Also, about the bubble gun that all along I thought was a complete silly playing idea - I guess I am licking my own spit here. I must shamelessly confess that I enjoy playing with it too - blowing bubbles and poking them. Naomi could not stop giggling when countless of bubbles that my husband or I blow come near her. Naomi is buckled up in her baby bike seat - ready to hit the road with Mom and Dad. And the baby bike seat that I thought was a total unnecessary buy - well, seemingly it is so much fun to ride a bike as a family. To begin with, we were given a tandem bike as a gift. Obviously, it is rather weird for one person to ride a tandem bike alone. In addition, it is not possible to leave Naomi all by herself at home when both of us ride the tandem bike around our neighbourhood. So yes, baby on board definitely adds different dimension for riding a tandem bike because it is recreational (and seriously attracts other people's attention too). As for our little lady boss, she clearly enjoys riding the tandem bike so much. I guess for her it must be an utter delight to just sit there at the back, do nothing but scream and babble whilst enjoying the scenery and the evening breeze. My point is, Mom can't really replace Dad's role when it comes to bonding or playing with children. For instance, I certainly can't provide that impossible degree of fun for Naomi when playing with her like what my husband does with her. My style of playing with Naomi is more serious and old fashioned - peek-a-boo, tickles, hand-clapping, story books, educational soft toys and so on. Boring? Toys like water gun, bubbles or remote control car would absolutely never occur to my mind and I would never ever imagine that my kid will love them so much. Moreover, quite often after accompanying my baby playing with her shape-sorter toy or squeaky doll for a good 8 minutes, I get bored and likely turn to some repetitive kiddie song DVD to amuse her. There, another confession from my side. In conclusion, let's try to minimize the prejudice towards our husband's somewhat playful character. Men and women are from Mars and Venus anyway. We are different in many ways and so are the ways we play with or entertain our kids. Perhaps, being a little bit playful in this context is good? We're all little kids at heart after-all, aren't we? It's Thursday again and it's time to present you with Happy Mom n Bub Photo Project: Week #11. Can't believe that I've been running this mini project for almost three months now (much thanks for your kind support!). Mommy Niken and Baby Daniella from Singapore. Can you spot Mommy Niken's and Baby D's matching outfits? Keen to show the world the cutest picture of you and your sweet little bambino in my blog too? Read here to find out how. It's on first come, first serve basis... so hurry up, Moms! Do send me a picture of you and your little bub, wherever you are! 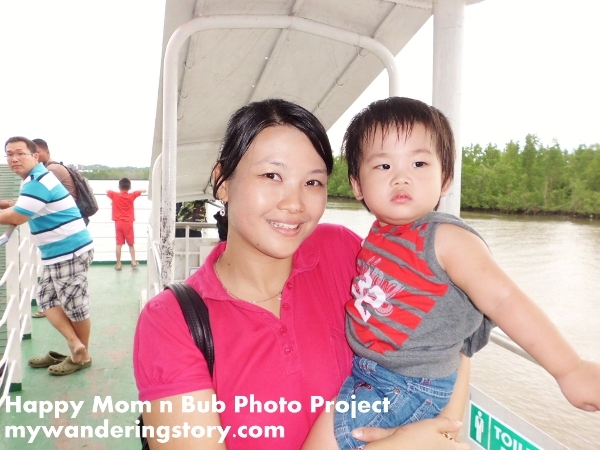 It's Thursday again and it's time to present you with Happy Mom n Bub Photo Project: Week #10. Please welcome Mom and baby who are at the center of attention this week! Mommy Eva and her little prince Marvel from Malang, Indonesia. 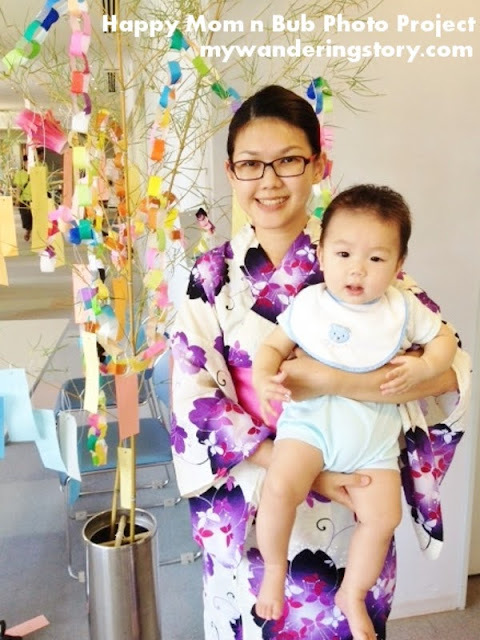 Mommy Eva is a big fan of cross-stitching and these days, on top of blogging about her daily life and motherhood, she also writes her cross-stitching musings at her blog called eva! 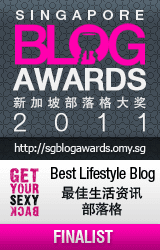 Want to show the world the cutest picture of you and your sweet little darling in my blog too? Read here to find out how. It's on first come, first serve basis... so hurry up, Moms! Do send me a picture of you and your little bub, wherever you are! Yesterday when I paid a visit to my Bro-in-Law's house in KL, I had a chat with my Sister-in-Law who just started learning to bake. She showed me all the baking ingredients and utensils that she recently bought and we talked a lot about making muffins, simple cookies and stuff. I realized that yesterday I forgot to feed Naomi with banana that I bought for her earlier this week; this said, today I had two very ripe bananas that were superb for baking ingredient. On top of that, I also happen to have a box of cheap dates at home and I don't really like them because they are too soft to my liking (even after I put them in the fridge!). I mean they're so incredibly cheap and I should have expected the substandard quality. Anyhow, after our late breakfast, I asked my husband to babysit Naomi and decided to make muffins (just like what I discussed with Sister-in-Law yesterday) by adapting this recipe. I could't follow the exact ingredients stated in the original recipe because my rum for baking expired long time ago (but I still kept it in somewhere in my kitchen cabinet because I have no heart to throw it away). Banana Muffins with Chocolate Chips and Dates. Here's the recipe I used for making the banana muffins that sure taste like they are from out of this world (they are so yummy!). Preheat oven to 160 degree Celcius. Coat the chopped dates and chocolate chips with a bit of flour. Set aside. In one large bowl, combine all the dry ingredients (flour, baking powder, baking soda and milk powder). In another large bowl, combine mashed banana with sugar. Add melted butter, vanilla extract and eggs. Mix all ingredients thoroughly by using a wooden spoon. Pour the wet ingredients to the dry ingredients. Fold the dry ingredients into the wet ingredients until well combined. Don't over-mix. Add dates and chocolate chips into the muffin batter and fold them together carefully. Scoop the muffin batter into muffin pan already lined with muffin paper. Fill the muffin batter all the way to the top. Bake the muffins for 25-30 minutes or until they are golden brown. Large muffins we had today! Light, fluffy and fragrant - these muffins are great for breakfast or paired with afternoon tea. TGIF tomorrow but it doesn't matter much to those who live in countries like Indonesia, Malaysia and Singapore because we are enjoying long weekend starting from today! Mommy Jennyfer and Baby Jason Akira from Tokyo, Japan. Last but not least, Selamat Hari Raya to those who celebrate! My little Naomi is surely beginning to leave her babyhood behind - I am both happy and sad with this fact. I am happy that my baby grows well, happy and healthy but on the other hand, I am a little sad thinking how fast time has flown. I mean where's my clingy little baby who used to snuggle in my arms or chest when she's sleeping? As my baby approaches her 1st birthday, she has shown plenty of signs of becoming an independent toddler. Naomi walked her first 10 tiny steps solo on 25th of July 2013 (Don't you agree that walking is a monumental milestone? I even remember the exact date when my baby did this for the first time!). Both my husband and I were so shocked when this happened as just the day before that, Naomi was still cruising and only be able to walk 2-3 steps. Now, she has not been practising her walking skill that much but she does that when she has the mood. I guess, somehow, she still prefers crawling (at turbo speed on some occasions) than walking. Naomi is a little chatterbox. She has clearly found her voice and her gibberish baby talk sounds like music to my ears. She babbles a lot and sometimes I feel like she is trying to communicate with us. Although I don't understand her, I still respond to her. Just by keep on talking to her. Sometime last month, Naomi was playing a toy that has a whistle on it. As she played with it, she began blowing the whistle part and actually managed to produce a whistling sound from it. The moment she realized a sound came from the toy she blew, she kept on doing it over and over again. Every time her blowing attempt's successful, she'd giggle. Now that Naomi is a master in standing up, crawling and showing separation anxiety - whenever she sees her Dad leaving a room or entering a toilet, she often crawls to that closed door, stands up and knocks on it non-stop until her Dad comes back to pick her or open the toilet door for her. Next, I guess Naomi's little fingers are getting stronger and now she loves picking up small objects using her thumb and forefinger. The worst part is that she is often intrigues by any tiny things that she can find and pick and then put it in her mouth to taste it. This said, my husband and I really have to constantly keep a good eye on her so she won't eat random stuff like bugs, dirt, rubbish or tiny plastic bits. I didn't know that a baby as big as Naomi would be so clingy too on some days and when it happens, she just wants me to carry her all the time. She'd follow me wherever I go and if I fail to cuddle or carry her because I am busy, she'd cry. Anyhow, I guess one day I'll miss Naomi's koala bear days. Also, I am not sure that babies younger than 1 year old can actually show tantrums. I think in the past few weeks, Naomi has shown us her anger and frustration in very strong manners when she doesn't get what she wants. When she's angry she'd cry, howl, kick, hit and even bite my shoulder. This little girl really needs some serious anger management. These days, Naomi is able to show a simple gesture of saying 'no' by shaking her head. At first, I found this new milestone really cute but eventually, it got really irritating especially when it happens during her feeding time. So yes, feeding time is now a bit challenging especially when Naomi now is able to refuse her porridge or milk by shaking her head. My Mother-in-Law taught Naomi to wave bye-bye sometime last month. Although her skill on this is not perfect yet but she can imitate us doing it. By the way, sometimes we let Naomi mingle with her almost 2 y/o cousin at my Mother-in-Law's place. They look cute together but they can't really play peacefully together yet. Either they fight for each other's toy (and my little one surely won't give in easily to her elder cousin) or they'd fight for Grandma's or Grandpa's attention. If Grandpa carries Naomi, her cousin will surely make noise asking to be carried too, and vice versa. Last but not least, to those of you who are curious about Naomi's feeding schedule at this age - I feed her with rice porridge twice a day, 1 serving of mashed fruit (if I have any at home) plus 5-6 feeds of formula milk in a day. Usually I begin her day with formula milk and only feed her with first bowl of porridge in late morning or afternoon. I give her the second bowl of porridge in the evening or around dinner time. Feeding her now is definitely not as easy as when she was younger as she is now able to show emotions and refuse food from us when she's not that hungry yet or not in the mood for eating or drinking milk. Recently, I was contacted by a marketing agency from Denmark, called Action Europe Copenhagen, with regards to a market research on diapers that they are currently doing. Action Europe Copenhagen plans to fly from Denmark all the way to Kuala Lumpur sometime this month to do a market research on diapers with 6 selected Malaysian moms. Basically, they would like to conduct casual face-to-face interviews with some mothers who live in Kuala Lumpur on how they take care of their children in general. For instance, who takes care of the kids on daily basis, are you a working mother or stay-at-home mother, what brands of diapers that you use and so on. Indeed familiar topics for you, yes? Original photo source is here. I have personally seen the leading questions prepared by Action Europe Copenhagen for this interview and found them really interesting and relevant to me (and any other moms with young babies!). I am sure these questions will be very easy for you to answer as they are based on your daily life dealing with your baby and his/her diapers. The interviews will be held on 20th and 21st of August during daytime at one of the cozy restaurants inside the Hilton Kuala Lumpur Hotel. Each interview (individual) session will take about 1 to 1.5 hours of time (and trust me, it will be fun and you won't feel the time passes by during this chit-chat session!). Those selected Moms who actually show up during the interview will be given cash reimbursement of RM 150 as a token of appreciation. If you meet the above criteria and feel that you can share your motherhood story in this one-to-one short interview session on either day of the above-mentioned dates, please do contact me at mywanderingstory@gmail.com before Friday, August 16th, 2013 for further logistical arrangements. Thank you so much and I look forward to see some Malaysian mothers joining this interesting interview on the subject that you definitely know the most! Updates: This opportunity has been closed. A lot of Moms showed their interest to join this interview; however, at the end of the day, we could only pick 6 of them due to time constraint. Thank you very much for your enthusiasm!